The original Mecinus janthinus is now recognized to have included a cryptic sister species, M. janthiniformis (Tosevski et al. 2011). This recognition followed many North American introductions of what was thought to be a single species of Mecinus for use as a biocontrol agent against exotic toadflax (Linaria spp.). Because of the early failure to recognize the two species, some of what follows in this species account may pertain to both species. [From Carney et al. 2004; Wilson et al. 2005; Schat et al. 2007; Tosevski et al. 2011] Length 2.3-4.0 mm (rostrum excluded); mean length of males 3.3 mm, females 3.6 mm. Integument black except pronotum and elytra dark blue with metallic reflections. Rostrum in lateral view moderately and regularly curved, moderately long in male (0.80-0.88X as long as pronotum length), somewhat longer in female (1.03-1.09X as long as pronotum length); rostrum moderately striate-punctured with numerous stout setae to apex (male) or striate-puntured with stout setae only in basal half then almost smooth (female). Pronotum sculpture formed by deep punctures regular in shape and size, intervals between punctures narrow, smooth and shiny, clearly visible between sparse seta-like long white scales, widest at basal third. Elytra very long, about 2X as long as wide, with interstriae roughly sculptured and covered with recumbent seta-like white scales almost completely arranged in a single median row. Profemora with distinct sharp tooth in male, unarmed in female. Aedeagus with sides parallel, gradually narrowing in distal third, toward apex ending in form of subacute tip. In Eurasia, adults overwinter in stems and emerge early March, egg-laying late March to mid-June (Tosevski et al. 2011). In North America, adults active early April to mid-August (overwinter other months), eggs early May to early July, larvae mid-May to mid-August, pupae mid-June to mid-September (Jeanneret and Schroeder 1992; Wilson et al. 2005; McClay and Hughes 2007). Probably best differentiated from closely-related species by host plant specificity, smaller body size (length), apical portion of female rostrum in lateral view less curved, punctures on pronotum slightly larger and less densely adpressed, scales of elytral interstriae less dense and arranged in one median row (not two), aedeagus with sides parallel (not abruptly narrowed) and ending in form of subacute tip (not subtruncate tip). Native Range: Northern Europe (Sweden, Baltic States), central and southeastern Europe (Great Britain, France, Belgium, Holland, Poland, Germany, Switzerland, Italy, Czech Republic, Slovakia, Hungary, Austria, Serbia, Ukraine, Moldova Republic, Romania, Bulgaria, Greece), Russia from the western borders to south-central Siberia, the Caucasus, Turkey; to about 500 m elevation (Jeanneret and Schroeder 1992; Tosevski et al. 2011). North America: First introduced in Canada in 1991, the US in 1992 (Sing et al. 2005) or 1995 (Wilson et al. 2005). 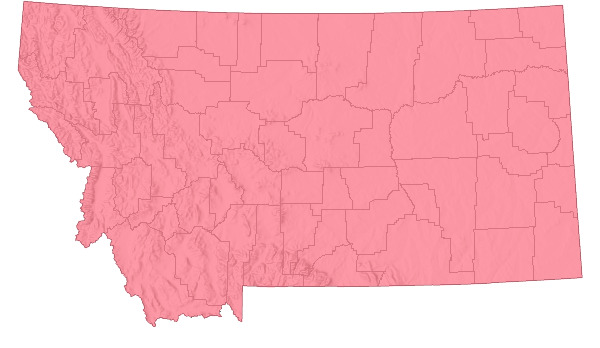 In Canada, reportedly established in British Columbia, Alberta, and Saskatchewan (Saner et al. 1995; Wilson et al. 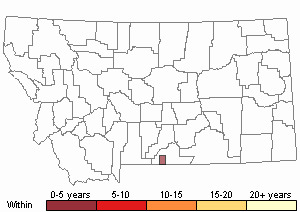 2005), but mostly on Linaria dalmatica, not the presumed primary host plant Linaria vulgaris (Tosevski et al. 2011; Hinz et al. 2014). Possibly this species (in addition to M. janthiniformis) established south in western US to California, Colorado, and Utah (Wilson et al. 2005; Breiter and Seastedt 2007; Hinz et al. 2014). 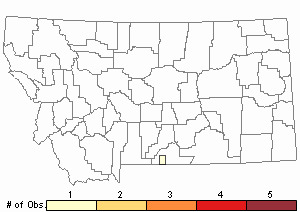 Major releases also reported in Idaho, Montana, North Dakota, Oregon, South Dakota, Washington, and Wyoming (Wilson et al. 2005), but these likely included Mecinus janthiniformis. Non-migratory; can disperse > 3.2 km in four years (Wilson et al. 2005). Arid forest, lowland pasture, and rangeland supporting large-stemmed toadflaxes (Linaria) (Wilson et al. 2005; Tosevski et al. 2011). Host plants for larvae and adults Linaria (toadflax), primarily Yellow Toadflax (Linaria vulgaris) (Tosevski et al. 2011). Earlier reports (prior to split of Mencinus janthinus into two cryptic species) included additional toadflax species as host plants in Eurasia (e.g., L. dalmatica, L. genistifolia, L. repens, and Chaenorrhinum minus). Feeding choice trials showed no significant difference in number of eggs laid and number of feeding marks on L. vulgaris from Canada, L. vulgaris from the native range in Europe, and L. dalmatica from Canada, implying both species of Linaria established in North America were suitable host plants for M. janthinus. Adults also infrequently nibble on other plant species (Collinsia, Cymbalaria, Digitalis, Gratiola, Kickxia, Mimulus, Scrophularia, Solidago, Veronica) (Jeanerret and Schroeder 1992). Also able to feed and complete development in captivity on native Maurandella antirrhiniflora, Neogaerrhinus strictum, Nuttallanthus canadensis, Sairopcarpus nuttallianus, and S. virga, possibly also Nuttallanthus texanus in the field, as well as exotic Antirrhinum and some additional Linaria species (Wilson et al. 2005; Breiter and Seastedt 2007; McClay and Hughes 2007; Hinz et al. 2014). Larvae feed in host plant stems, adults feed on leaves and in stems (Jeanerret and Schroeder 1992; Wilson et al. 2005). Copulation occurs shortly after adults emerge in spring from overwintering in dry host plant stems. Females lay eggs in shallow holes chewed by female on actively growing host plant shoots at the widest point of the stem (usually lower portion of stem, in stems typically 0.9 mm diameter or greater), 1 egg per hole, 1 egg (rarely 2 eggs) per shoot. Holes with eggs have lids to protect egg from desiccation and predation. Females lay about 1 egg/day under laboratory conditions, 45 to > 100 eggs total. Eggs hatch in 6-7 days under laboratory conditions, develop from L1 instar to L3 instar and pupae in 23-40 days, larvae feed and mine central part of stem usually for 1-2 cm, but up to 10 cm, pupate in cell within host plant stem, adults emerge from pupae in another 27-29 days, but remain in pupal cells and hibernate. Only one generation produced/year (Jeanneret and Schroeder 1992; Wilson et al. 2005; Tosevski et al. 2011). Biological control agents are most effective when integrated with other biocontrol and traditional methods. With Yellow Toadflax (Linaria vulgaris), eight introduced insect species attack various parts or stages of the host plant (including flowers, seed capsules, foliage, and roots). Mecinus janthinus, a stem-boring agent, does not appear to shift feeding preference to most native North American (non-target) Linaria and related Scrophulariaceae species when given opportunity to do so (Sing et al. 2005). However, given the potential to develop on non-target native host plants, some of which are rare species in some states, additional testing under multiple-choice conditions and postrelease monitoring is required to determine host ranges of this biocontrol beetle (Hinz et al. 2014). 1) Determine beforehand the efficacy (ability to control the target weed), host plant specificity, and biocontrol availability for the biocontrol insects to be used. 2) Select release sites based on their desired function. Field nursery sites (for future biocontrol collection and redistribution) should exceed 10 acres with fairly continuous distribution of toadflax, be safe from disturbance, and be accessible for regular monitoring. Sites for long-term monitoring should be buffered from other weed management programs and disturbance (grazing) for up to 10 years. Sites not intended for monitoring or biocontrol collection should be sufficiently large and free from disturbance to provide the agents the best possible chance to survive and flourish. 3) Agents should be stored and transported in sturdy containers that are kept shaded, cool, and well ventilated. An example is a pint-sized, nonwaxed, paperboard carton. Plastic containers can work with large holes cut in lid and protected with mesh screening. Avoid glass or metal containers. Prepare containers for agents by adding cut leafy stem pieces of toadflax for food, shelter, moisture. Do not add water. Transport containers in a large cooler with pre-frozen icepacks. Specifically to Mecinus janthinus, adult beetles are the life stage to transfer and introduce. Adults can be obtained at sites with established beetle populations by tapping plants over tubs (tray sampling) to dislodge beetles, or sweep netting, then aspirated and transferred to containers. At least 200 adult beetles are recommended for initial release of stem-boring weevils, which can be collected in 30 minutes or less if the source population is appropriately large to support redistribution collections. Collect adults that are actively feeding and mating on top portions of plants. Transport and release agents as soon as possible (preferably within 24 hours). Release should occur in good weather in cooler early morning or evening hours. Release on the ground at the base of stems in a dense stand of young host plants in full sunlight. Carney, V.A, J. Rau, S.M. Little, and R.A. DeClerck-Floate. 2004. Rapid differentiation of the sexes of adult Mecinus janthinus (Coleoptera: Curculionidae) based on external leg morphology. Canadian Entomologist. 136:835-837. Hinz, H.L., M. Schwarzlander, A. Gassmann,and R.S. Bourchie. 2014. Successes we may not have had: a retrospective analysis of selected weed biological control agents in the United States. Invasive Plant Science and Management. 7:565-579. Jeanneret, P. and D. Schroeder. 1992. Biology and host specificity of Mecinus janthinus Germar (Col.: Curculionidae), a candidate for the biological control of yellow and Dalmatian toadflax, Linaria vulgaris (L.) Mill. and Linaria dalmatica (L.) Mill. (Scrophulariaceae) in North America. Biocontrol Science and Technology. 2:25-34. McClay, A.S. and R.B. Hughes. 2007. Temperature and host-plant effects on development and population growth of Mecinus janthinus (Coleoptera: Curculionidae), a biological control agent for invasive Linaria spp. Biological Control 40:405-410. Saner, M.A., Clements, D.R., Hall, M.R., Doohan, D.J, Crompton, C.W. 1995. The biology of Canadian weeds. 105. Linaria vulgaris Mill. Canadian Journal of Plant Science. 75:525-537. Schat, M., S.E. Sing, and R.K.D. Peterson. 2007. External rostral characters for differentiation of sexes in the biological control agent Mecinus janthinus (Coleoptera: Curculionidae). Canadian Entomologist. 139:354-357. Toševski, I., R. Caldara, J. Jović, G. Hernández-Vera, C. Baviera, A. Gassmann, and B.C. Emerson. 2011. Morphological, molecular and biological evidence reveal two cryptic species in Mecinus janthinus Germar (Coleoptera, Curculionidae), a successful biological control agent of Dalmatian toadflax, Linaria dalmatica (Lamiales, Plantaginaceae). Systematic Entomology (2011), DOI: 10.1111/j.1365-3113.2011.00593. Wilson, L.M., S.E. Sing, G.L. Piper, R.W. Hansen, R. De Clerck-Floate, D.K. MacKinnon, and C.B. Randall. 2005. Biology and biological control of Dalamatian and Yellow Toadflax. Morgantown, WV: USDA Forest SErvice. FHTET-05-13. 116p. 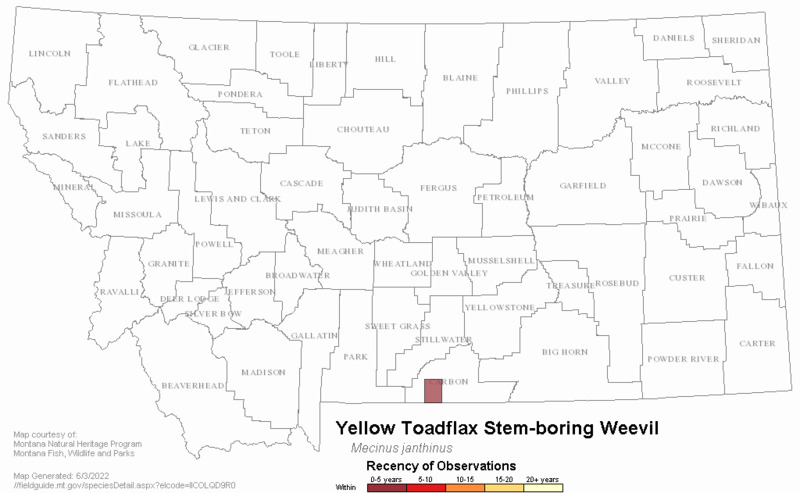 Web Search Engines for Articles on "Yellow Toadflax Stem-boring Weevil"